Son of Duke John the Fearless. 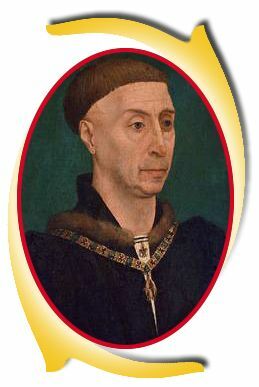 After his father was murdered (1419) at a meeting with the dauphin (later King Charles VII of France), Philip formed an alliance with King Henry V of England. Under the Treaty of Troyes (1420, Philip recognized Henry V as heir to the French throne ; the dauphin was disinherited. Philip aided the efforts of Henry and his successor to establish English rule in France. Finally, in return for important concessions, Philip ended the English alliance and made peace with Charles VII in the Treaty of Arras (1435). Despite the truce, Philip's relations with Charles were not always amicable. He temporarily supported (1440) the rebellious nobles in the Praguerie and gave asylum to the dauphin (later King Louis XI), who was constantly in revolt against his father. During Philip's reign the territory of his duchy was more than doubled. Through inheritance, treaty, conquest, and purchase he acquired Hainaut, Holland, Zeeland, Friesland, Brabant, Limburg, Namur, Luxembourg, Liège, Cambrai, and numerous other cities and feudal dependencies. Uprisings in Bruges (1436) and in Ghent (1450-53) were suppressed. In 1463, Philip was forced to return some of his holdings to Louis XI. His vow (1454) to go on crusade was never fulfilled. Philip's court was the most splendid in the Western Europe of his time. He was succeeded by his ambitious son, Charles the Bold, who took control of the government from Philip in 1465.